On the nineteenth anniversary of the massacre at Recak, Prishtina Insight visited the village and met with Egzon Bilalli, who shared his experiences living in the shadow of one of the largest reported mass killings of Kosovo Albanians during the 1998-99 war. On a steep hill overlooking the village, a great white archway leads to the memorial of the Recak massacre. A great marble plaque bears the names and faces of the victims, while a winding path leads to rows of flower-covered graves. A group of workers are busy doing some last-minute repairs before the ceremony on Monday, happy to help out for free out of respect for the victims. Every January 15, the massacre in Recak is remembered through a ceremony attended by the families of the victims, townspeople, local politicians, and representatives from Prishtina. Walking through the streets of Recak we met Egzon Bilalli, a nineteen-year-old resident of the village who agreed to be our guide. He was born only a few months before the massacre occurred and grew up listening to the stories of what happened that morning. Early on January 15, 1999, shooting was heard from the direction of the small village of Recak, located one kilometer outside of Shtime. It was soon discovered by the OSCE international monitoring body present at the time that an estimated 45 Kosovo Albanians, including men, women and children, had been shot and killed at close range by Serbian forces. The Recak massacre was not only proof of terrible human rights violations happening in Kosovo, but was also an incident that sent waves through the international community, setting in motion a series of events that would lead to the withdrawal of Serbian troops from Kosovo and the end of the war. 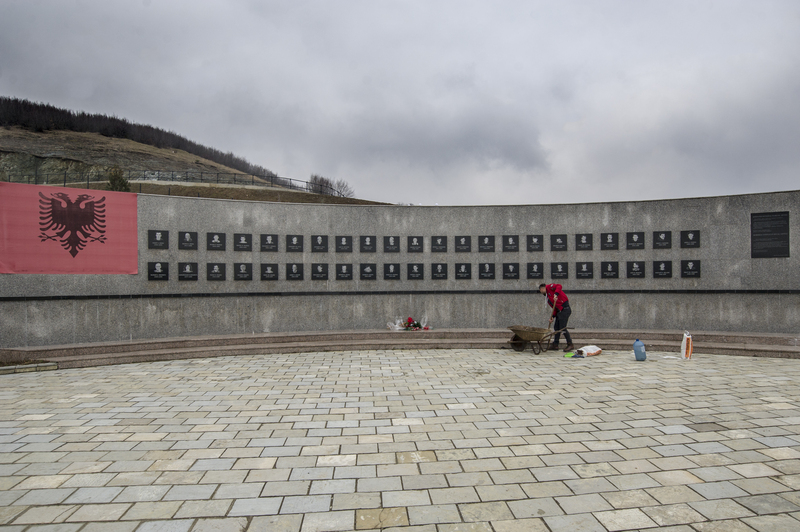 Workers fixing the memorial before the commemoration on January 15. | Photo: Atdhe Mulla. We continue through the village streets, and Egzon begins to take us to the area where people were killed. As we climb to the set of stairs built to make it easier to visit the site, Egzon pointed to a house whose walls still bore bullet holes from that day. It was in its basement that the group of civilians had sought shelter and were later discovered and rounded up by the Serb forces. “They found them, beat them, and they led them uphill,” said Egzon, as he recounted the story told by his uncle Afet, a survivor of the massacre. That day, Egzon’s other uncle, Lutfi, died, and his grandfather Hasan was wounded. Egzon was only nine months old at the time of the massacre, hiding in Ferizaj with the rest of the family. The stairs ended and we began following a muddy trail that led further into the woods. Trees and bushes line both sides of the narrow trail, and if it were not for some rocks painted bright red, the path might have seemed like any other. Egzon’s grandfather, Hasan Bilalli, began this tradition, painting red each spot where blood or the body of a person had been found. Continuing up the path, red rock after red rock begins to overwhelm you. 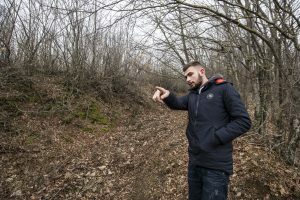 Egzon showing us the path through the forest where bodies were found. | Photo: Atdhe Mulla. Each year, after paying respects to the victims, Egzon’s grandfather Hasan would take his grandkids for a walk up the ‘red trail.’ He would point to each red spot and recount to them the stories of the people who had died that day. Hasan Bilalli passed away about four years ago, but his ‘red trail’ tradition lives on through his grandson Egzon and others in the village. They continue to repaint the stones in red two to three times a year, in this way keeping alive the memories of those who were killed. Keeping the memories alive is not easy; the Recak complex has already begun to fall into disrepair — broken steps, fallen marble slabs, and other general wear and tear caused by exposure to the elements — that the workers were hurrying to fix up before Monday’s commemorative service. The memorial. | Photo: Atdhe Mulla. Overlooking the memorial itself is the man responsible for bringing the story of Recak’s victims to the rest of the world. A six-meter-high statue of William Walker, chief of the OSCE Verification Mission present in Kosovo at the time, was unveiled last year on the anniversary of the massacre, honoring him for his role in facilitating international intervention in Kosovo. Walker’s allegations, coupled with the recent memory of atrocities perpetrated elsewhere in the Western Balkans, ensured that principal NATO members led the charge to intervene in Kosovo, refusing to sit back and allow atrocities to escalate. Following failed peace negotiations in Rambouillet, France in February-March 1999 — as well as the threat of airstrikes if Milosevic was to continue using force — the events in Recak were used as justification for the ensuing military campaign and bombing of Yugoslavia, which led to the withdrawal of Serbian forces from Kosovo. Nineteen years on, survivors and families of the victims of the massacre have not found closure or justice for the massacre. Slobodan Milosevic and others were charged with the murder of the victims of Recak at the ICTY in 2001. However, Milosevic’s death in 2006 left the case unresolved. 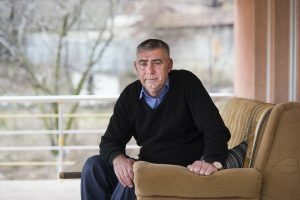 In 2011, Vlastimir Djordjevic, a former senior Serbian police official, was found accountable for crimes of deportation, forcible transfer, murder and persecution throughout Kosovo during the war. Djordjevic is currently half way through serving an 18-year sentence for his crimes. While the ICTY concluded that Djordjevic was ultimately responsible for the massacre at Recak due to his presence close by at the police station in Shtime the morning 45 Kosovo Albanians were killed in Recak, the Court did not formally include these killings in the charges for which he was prosecuted. In spite of this small recognition of his responsibility, international justice once again fell short for the families, victims, and survivors of January 15, 1999. On top of this, the residents of Recak feel sidelined by Kosovo’s own institutions — from lack of economic prospects to the feeling that others are profiting from their tragedy. “In Recak we have been walked over, as if we are second class citizens,” said Asllan Bilalli, Egzon’s father. | Photo: Atdhe Mulla. But his son Egzon has ambitions to contribute to his home village. He is currently attending his first year of university, studying psychology. He reflects that the events in Recak might be the reason he decided to take on this topic. Being so close to the tragedy, he saw the importance of understanding trauma and mental health. “There are many people in the village who are still not in a state to talk about the events that happened. It is beyond me how these people have been left without treatment for all this time,” he said. One week before the anniversary, Recak’s youth band together to organize a commemorative football tournament that they call “The Days of Recak.” As one of the organizers, Egzon, as well as his friends, have campaigned for the Municipality of Shtime to support them, without much success, except for some medals donated last year for the winners. It is an intentional choice to host the event a week before the mournful commemoration. Recak’s youth bring a breath of fresh air to the village and ensure that Recak is not only defined by the tragedy that happened there. Correction January 15, 2017: An earlier version of this article mistakenly stated that the stairs were built by the inhabitants of the village. They were built by the Ministry of Environment and Spatial Planning.